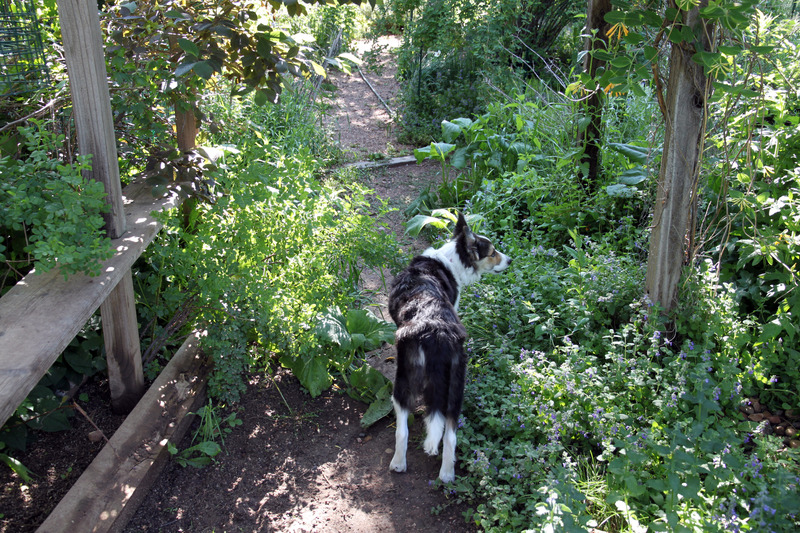 Greetings and salutations, everyone; yes, once again it is I, Mani the tiny, but much bigger than the last time I posted, purebred border collie, filling in for the guy I live with, and here to bring you the latest news about me and my garden. You may remember me from such posts as “Passing The Time”, among quite a few others. Here I am in a characteristic pose. I know I’m not supposed to be chewing dish rags, but they’re really old and the guy I live with could do with some new ones. 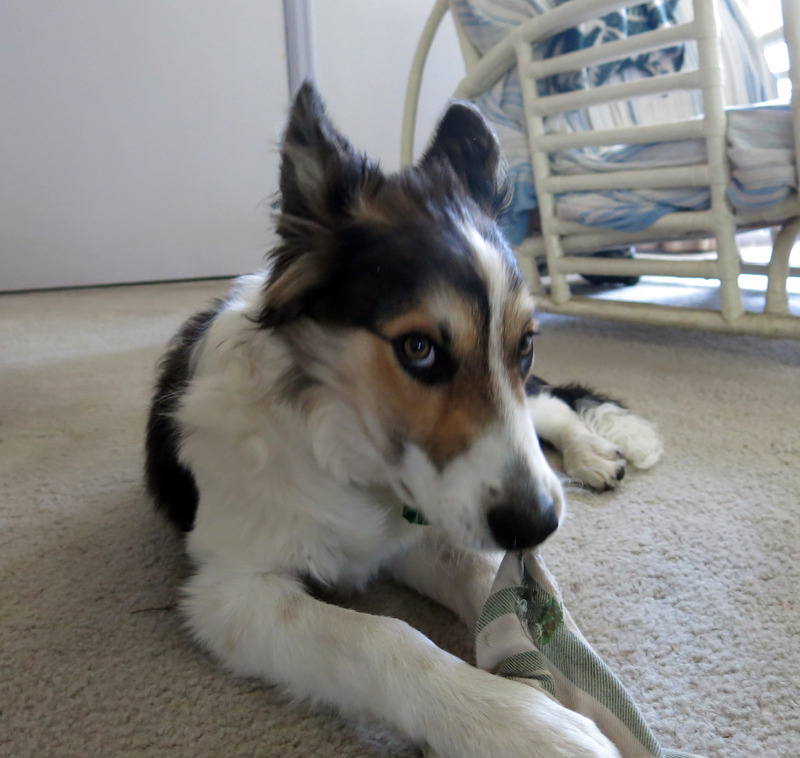 I certainly look cute doing things I’m not supposed to do, don’t I? Here I am pretending to be nonchalant. I’m usually hyper-chalant, of course. 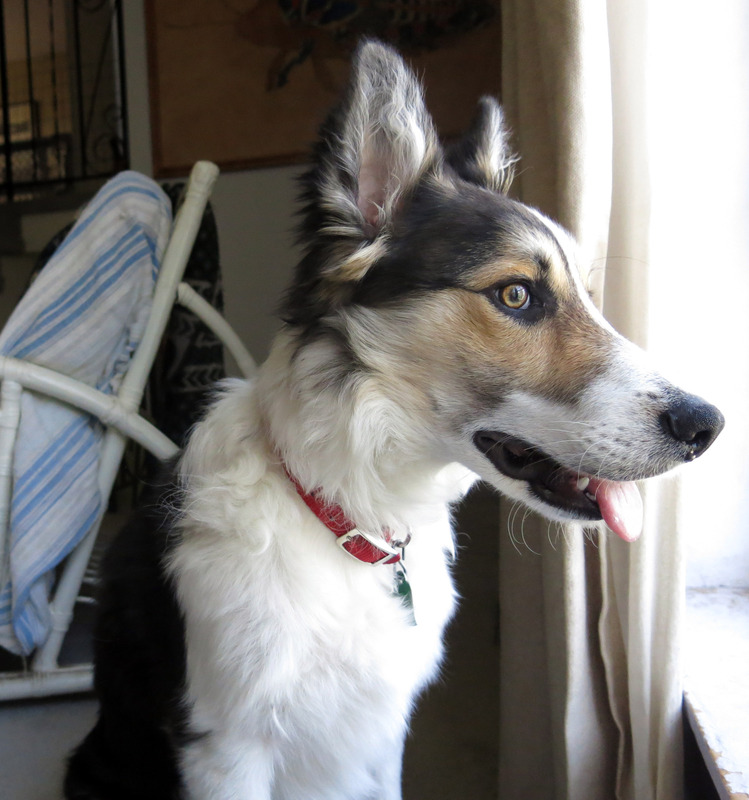 It’s been mostly raining and stuff, but then for two days it was hot, and I didn’t like that, because purebred border collies, which I’m, don’t like hot weather. I took naps, chased flies, and looked out the window. 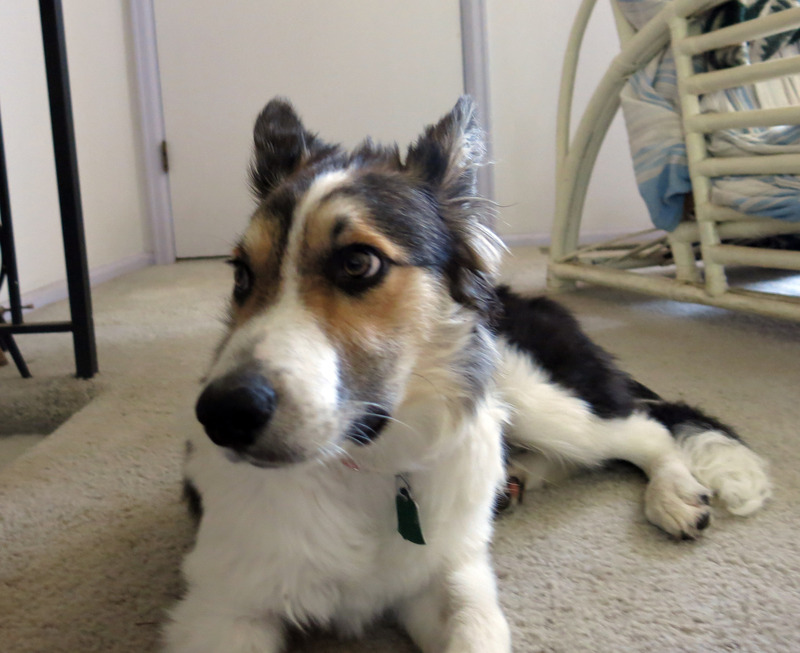 Then yesterday I went to Day Care, and I did okay, though not as well as the time before, and when the guy I live with came to get me, it started to thunder really loudly, and then hail. The guy I live with was worried that our car might be dented, but he said it was “only marble-sized” hail and that wasn’t so bad, so we waited in the vet’s office until it stopped, and then we drove home through pouring rain. 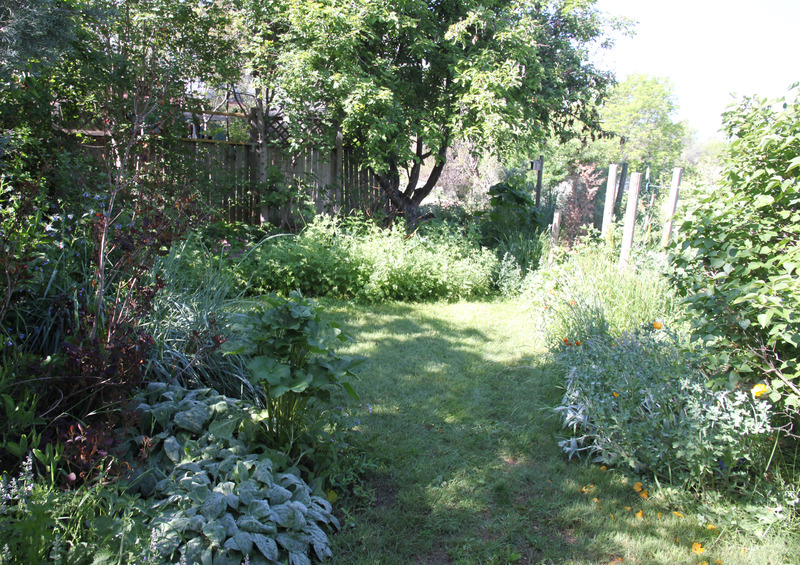 The guy I live with said we got about three quarters of an inch of rain (that’s 1.9 cm; I’m learning that, too), and that the garden was becoming “hopelessly jungly”. Most people would think that meant a lot of weeding, but it turned out that it meant more naps, which I liked. I’m kind of enjoying the way my life is unfolding now. You can see how jungly things are. Here’s the “way back”, which the guy I live with says is ultra-jungly. 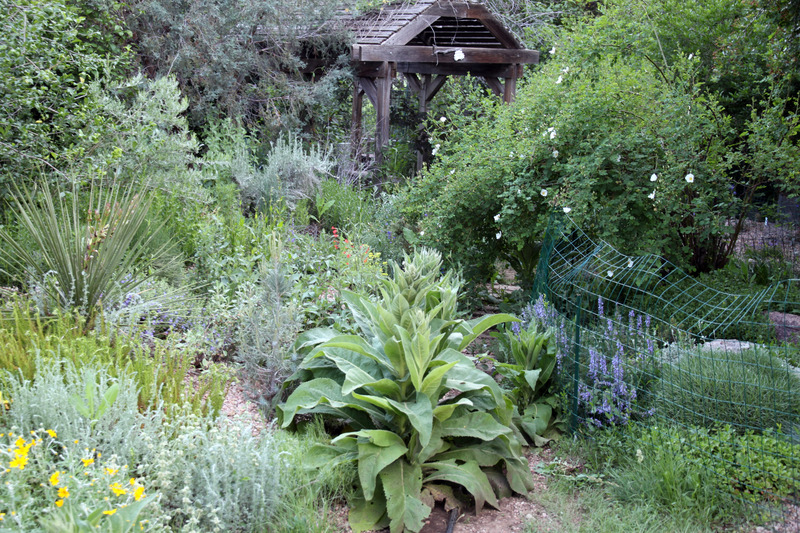 The area under the arbor is almost always bare of plants, but not this year. That yellow thing is a honeysuckle, Lonicera sempervirens ‘Sulphurea’, I think, which the guy I live with planted for the lady of the house, because she liked honeysuckles. He said it came from We-Du Nursery about a quarter century ago. 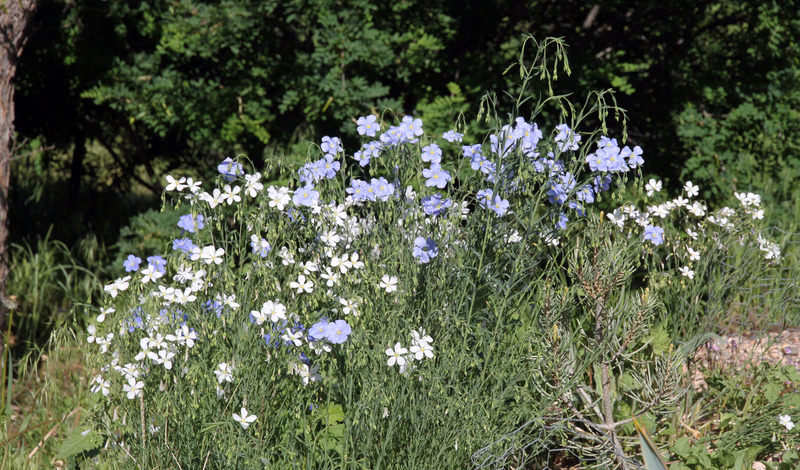 The supposedly all-white form of Linum perenne, or whatever, has become all-white, but with some blue. The guy I live with doesn’t know why, unless the white doesn’t come true from from seed. Look how jungly the original rock garden has become, though it’s been a good year for Asphodeline damascena (white) and Echium russicum (red). And talk about completely jungly, the path called “Pooka’s Shortcut” (because he blazed the trail, so to speak) is all but impassable. Except for by me, of course. Rosa kokanica is leaning way over. There is one really different thing about my life, and at first I didn’t like it at all, but we’ve done this a couple of times, and I think I’m going to like it. It’s called “going on a walk”. 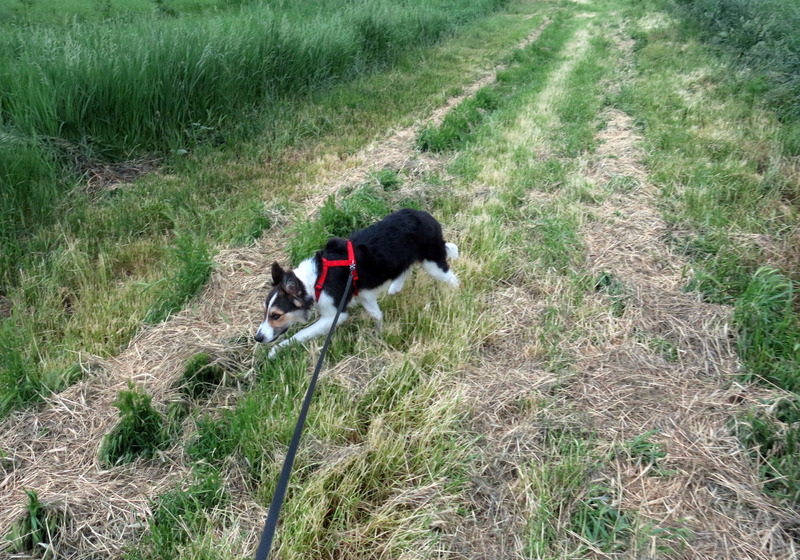 I think you can see from the picture that I have a tricolor face, but I’m basically what they call a “saddleback”, because the black doesn’t go all the way around my tummy, so I’m two kinds of purebred border collie, which is pretty advanced, if you ask me. Well, I guess that’s it. The guy I live with says we might do something eventually, but the pattern of my life so far seems pretty good. It is nice to have some grass to run on. And lie down in, if need be. The guy I live with is not hugely happy about this weather; it makes him very nervous, or so he says. The walk was pretty fun, though. With all the rain, I was wondering about the state of the creek, or canal. There’s my answer in the last shot. 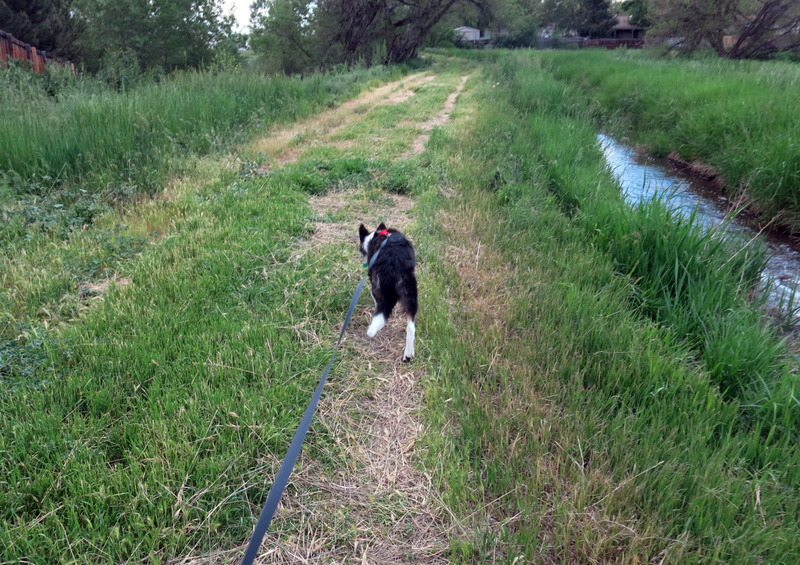 There might not be weeding going on at your place, Mani, but someone has been out mowing the canal pathway. As you have learned by now, naps are better than weeding. 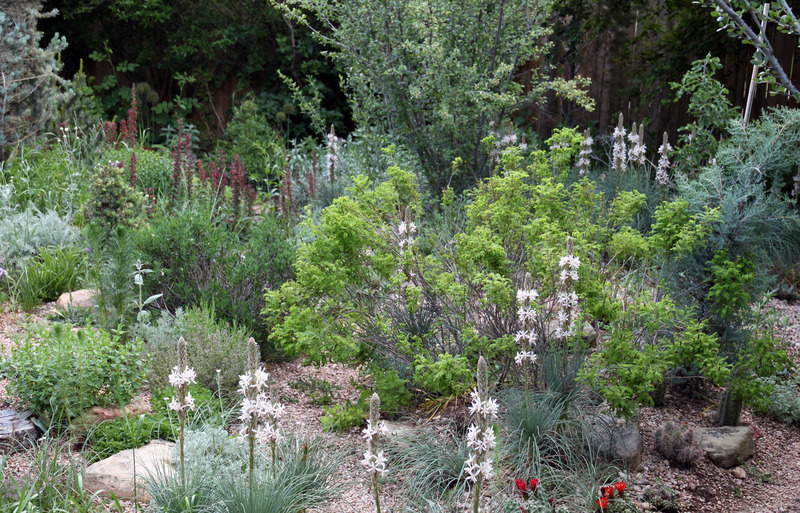 Great to see the garden leafed, budded and flowered out, texture everywhere. In Japan, we saw roses looking like your pretty kokanica. They were on a southern island lining a river bank, and the Japanese knew them as natives. Experts with us eyed the distance to China and came up with another origin theory. You are a clever border collie puppy, Mani, to come up with a title that enwraps both your life doings and your distinguished coat. Good going. And keep going. Walks are so much fun to do between naps. Thanks; the garden is extremely leafed out. The guy I live with is super nervous about all of this, considering the “horrible weather” we’ve been having. I didn’t notice much of it. He says we could have this horrible weather tonight, while we’re asleep, and he doesn’t like thinking about that. He says that sort of thing never used to happen, but it does now. The canal gates, or whatever, get opened some time in April, and water stays in there until October, I hear. There’s lots of water in the creek right now, too. If you do a search for Rosa kokanica on the blog there’s some stuff about it. They did mow. Yesterday morning. The horrible weather really happened elsewhere; like at DBG, which makes the guy I live with very unhappy. The post which just appeared was actually composed late last night, but it took so long for one of the movies to process that the guy I live with said it was Beddy-Bye time for little me. You look pretty snazzy in your red harness. Our dogs were terrible walkers and everyone said a harness would make them worse but as soon as we got them they stopped pulling. What about you? Are you a good walker? I mean after you got over your initial doubt. Asphodeline is just about the prettiest plant name I think. Does she smell good? It looks like she would. And those blooming cacti down around the base. Very lovely. I sure would like another video tour. How hot did it get those couple of days? It’s supposed to go up to 97 this weekend here.(S. Oregon) We don’t like it that hot either, but what can you do? Catch flies, I guess. I catch them and let them go outside. Thanks; it only got to about 86, with ten percent humidity, on the days when I was so hot. The guy I live with, who says he doesn’t want to scare me, says the alternative to hot, dry weather is something we prefer not to talk about at all. I don’t know if the asphodeline has a smell; it’s never been smelled, that I know of. I tried to catch something called a sphinx moth but it flew inside and the guy I live with let it go in the front yard. I’m an okay walker but I also like to run and make the guy I live with really dizzy, and he says we have to work on that. Damn, I gotta get me some Asphelodine, stat. Perfect spring for it, then? But it did dry out for a week here, so I should not complain. Also, have done a lot of transplanting and I didn’t have to water by hand as much, so again, I should not complain. What’s the 411 on the Asphelodine? What’s the 411? It’s a biennial, seeds all over the garden. Roots like daylilies or kniphofias. We’ve had two dry days, featuring sun, since April. There was a tornado warning here until 10 p.m. last night; very exciting. Not sure about cute in that first photo. I reckon you’ve got “guilty” written all over your face. Guilty, cute, all part of the same package. Another tornado watch for you today, and a tornado warning not too far away. It must be very scary. Well, we could talk about this, I guess, but it might cover more emotional ground than what people really want to hear, so the guy I live with says we just sit here, and do nothing. And watch Big Bang Theory over and over again. I don’t think people would mind anything you have to say when stuff like this is happening. The guy I live with is very much against Things That Go Bump In The Night. From experience. Practically anything I swipe gets me some sort of attention….